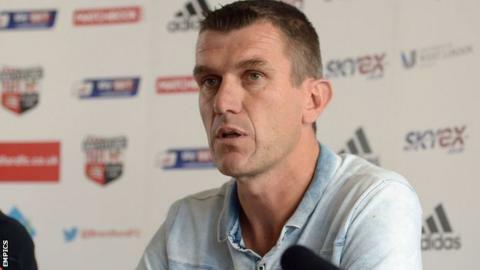 New Brentford head coach Marinus Dijkhuizen says he fully supports the club's ideas to apply statistical modelling to future player recruitment. On Monday, the Dutchman, 43, replaced Mark Warburton, who left at the club at the end of the season due, in part, to a disagreement over using statistics. "With all the information in the club, it's a big chance to get better as a team," Dijkhuizen told BBC London 94.9. "I love football. I'm open-minded and I want to develop myself." Upon appointing Dijkhuizen, Bees owner Matthew Benham said the club had "wanted someone who could share their vision" for the future as an innovative club. Brentford's recruitment is set to put focus on mathematical modelling and statistics which, allied to more traditional scouting methods, is referred to as a 'Moneyball' approach. Moneyball is a system which emerged in baseball in which the smart use of undervalued statistics allowed financially-disadvantaged teams to compete with better-resourced rivals. "For us, it's not just about statistics, but what you do with the statistics," co-director Rasmus Ankersen added. "We think it's important that you have objective analysis, as well as a coaches' intuition. When we talk about statistics, it's often been misunderstood. We just think there has to be the right balance." Dijkhuizen, who spent most of his 14-year playing career in the Netherlands, added: "I think the football in the Netherlands is maybe more tactical. "I hope we can find a mix of English football and a little bit of Dutch football. "The Championship a very hard league with a lot of games and big clubs. I think maybe it is harder to play in the Championship than in the Eredivisie."